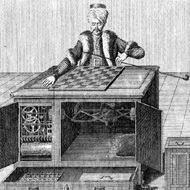 The history of the chess-player automaton of Wolfgang von Kempe­len (1734 – 1804) and its legend have engaged artists, scientists and laymen for centuries. Now, more than two hundred years after von Kempelen ’s death, the joint exhibition of C3 Foun­dation and the ZKM in Karlsruhe, setting the two outstanding mecha­nical inventions of the polyhistor – the chess-player automaton and the speaking machine – at the centre, attempts to focus not only on the most en­during memories of his almost unfathomably far-reaching career. Alongside the portrayal of von Kempelen as scientist, engi­neer, artist, showman, civil servant and private individual, the exhibi­tion broadens the picture onto the Court of Maria Theresa and Jo­seph II, the mechanical inventions of the epoch, the invention of the era of invention, the Freemasonry movement, and the Turk- and puppet-mania of the century. Even though we are separated from von Kempelen ’s world by more than two hundred years, we can still recognise the similarities bet­ween that atmosphere of scientific discoveries constantly out­bidding each other, with technical and technological innovations appearing in the second half of the 18th century, and the multi­fariousness of art forms, and our own present. The other aim of the exhibition is the elaboration of the history of innovative thinking, and the presentation of elements of technical and conceptual history inspired by von Kempelen and his mecha­nisms. Alongside the historical correlations, the show presents con­temporary media artworks – in part, commissioned specifically for this occasion – that, taking the sphere of thought of von Kempe­len ’s inventions as their point of departure, discover the relationship bet­ween the ideas of the Enlightenment and the questions of the pre­sent day. Following its presentations in Budapest and Karlsruhe, the exhibition is planned to travel to Slovakia and Austria from the second half of 2007 through the end of 2008.